2017 saw two SixThirty portfolio companies raise significant investment. Both companies are based in Israel and came to St Louis to work with SixThirty and its corporate partners. The trip must have been worth it for the founders: the two fintech startups — BondIT and PayKey — raised $14.25M and $10M respectively. The program’s primary focus is on ‘later-than-early’ stage startups: companies that have a working product, market traction, and early revenue in the B2B market and that are ready to refine and “battle-test” their go-to-market strategy. Launching a successful financial technology product takes more than funding and a good idea. Fintech founders face complex institutional and regulatory hurdles: they may need money transfer, banking, trading or commodities licenses. More than that, successful product-market fit depends on close alignment with the needs and operating practices of major financial institutions. Fintech startups often face a Catch 22: institutions don’t want to open their doors to startups with an unproven product, and startups can’t prove (let alone improve) their product without embedding themselves in larger institutions. SixThirty tackles the built-in complexity of fintech innovation by investing in the process of product-market validation, while traditional investors would expect this milestone to be passed long before they get involved. That’s not just a joke about St. Louis’ spot on the banks of the Mississippi — it’s a strong reminder of the city’s provenance as a massive financial services hub. St. Louis has the highest density of investment advisors outside of Boston and New York City. In a recent article, the Economist also named St. Louis the largest center of financial services firms outside of Manhattan. 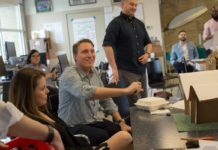 So SixThirty’s choice of place is no accident: during the process of product-market validation, the program gives entrepreneurs a direct line into the financial ecosystem. Founders can expect meetings with the likes of State Farm, UMB, Edward Jones, Worldwide Technology and the Reinsurance Group of America — to name but a few. Since most SixThirty companies enter the program with well-developed products, relationships with institutions help them fast-track the path to revenue. “Fintech startups go to San Francisco to find capital. 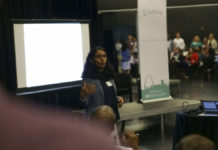 They come to St. Louis to find revenue,” Kamra quipped during a presentation at the 2017 Inside/Outside Innovation Summit. SixThirty is sometimes referred to as a startup accelerator. The program’s leaders reject the label, as an empty catch-all term for programs serving early-stage ideas. Personally, I think of SixThirty as a Startup Collider. A particle accelerator collides molecules into each other to see what new discoveries can be made in quantum physics — from bonds to reactions to vacuums and even basic gaps in our knowledge of how to measure these effects. SixThirty “collides” fintech startups into enterprise companies, to see what opportunities and partnerships emerge. Through direct introductions to leading enterprise organizations — who could be the next buyer or partner for a startup’s product — SixThirty initiates a critical customer engagement process. That process acts like a crucible for a chemical reaction between your idea and the larger needs of the market. Naturally, it’s impossible to know exactly what will emerge from the collision of a fintech startup and financial enterprise. Presenting at the Inside/Outside Innovation Summit 2017, Kamra explained that the attitude towards innovation is shifting from one of disruption to collaboration. The answer may not be as apparent as startup founders may like to think. Disruptive technologies carry many implications for evolution of the financial services industry, but the specific applications and use cases are not always self-evident. Kamra argues that most startups succeed at the point where they identify friction in the industry. Those points of friction carry hidden costs. And targeting those hidden costs are the phenomenally disruptive opportunities that lie hidden in plain sight. “Zara, the clothing brand, is a canonical example,” he explained. Zara identified that markdowns – discounts and sales – are the biggest cost in the apparel industry — but they don’t show up anywhere on a traditional profit and loss statement. Prior to Zara, the fashion industry was all about predicting demand, with lead times of 9 to 12 months, or more, between fashion runways and products appearing in stores. But it turns out that customers are fickle and predicting demand is very, very hard to do: for the most part, fashion companies were terrible at it. Huge losses from markdowns were accepted as a basic cost of doing business, instead of as a problem to fix. Zara challenged this way of thinking by radically reducing the time between designing, producing and shipping new designs. They accelerated traditional seasonal fashion cycles, re-tooled the supply chain and information systems to rapidly adjust production and inventory in response to customer reaction and shifted customer behavior from deferral towards urgency. Eager buyers had to respond to scarcity rather than wait for discount sales. The biggest cost to the business was reduced — while demand increased. For Kamra and SixThirty, collaboration precedes disruption. Zara’s greatest innovation wasn’t in its products, it was in how the company rethought basic principles for bringing those products to its customers. The same principle applies in fintech. A new software product may take only $1M to develop or license. But for an incumbent to adopt the product, they may still need to spend $4M to train their employees to use it and another $3.5M to integrate the new codebase with their legacy systems. Hidden costs escalate quickly. Zara’s true innovation wasn’t in products, but in process, to overcome a point of market friction. Similarly, Kamra contends that real change in the finance industry doesn’t come from “shiny objects” — new tech products and platforms — but from overcoming breakpoints in the industry around human behavior and data. Such experiences are why SixThirty moved from being a straightforward venture capital fund to a startup collider – an innovation platform that infuses capital into promising startups looking to connect with large corporations. SixThirty can pair high potential talent with the curiosity and market intelligence needs of the nation’s major firms all under one program. What Does That Mean For 2018 Applicants? Colliding your product offering with the market means it will go through rigorous testing and refining, so much so, that founders need stamina to engage with the strategy. That’s true of any startup, fintech or otherwise. The end result may not be identical to the idea you started with, but it’s exactly that outcome which SixThirty invites founders to consider. It’s like applied science. Theory becomes a lot more valuable to everyone when it can be applied to a specific use case. And the proof is in the pudding. BondIT, a SixThirty portfolio company, raised over $14 million last year. And PayKey raised $10 million. What Was The Experience of Last Year’s Portfolio Companies? “SixThirty was, for me, an eye-opener for the US Market. The mentors we received through SixThirty helped us gain access to the most strategic players in the US,” Etai Ravid, CEO and Co-Founder of BondIT told EQ. What’s especially exciting about their traction is that the BondIT teams were not natural born fixed income asset traders. BondIT’s Co-Founder and Chief Scientist, Dr. Hillel Raz, PhD, is primarily an expert in machine learning. BondIT plans to use the $14.25M invested by Fosun to expand on two fronts: deeper into the U.S., the world’s largest market; and outward, to gain a foothold in China, the world’s third-largest but fastest-growing. Remarkably, for the financial services industry, it took founders who were not natively ‘in’ the fixed income market to come up with a solution that was transformative. It was only after the fact that BondIT and SixThirty brought in fixed-income experts to help with adoption, industry practices and defining a path to market.